The Madison Common Council adopted in late March a resolution setting 2030 as the deadline to achieve a 100% renewable energy and net-zero carbon goal for city operations. Spearheaded by the Sustainable Madison Committee (SMC), the resolution empowers city staff to lead by example and initiate aggressive policies and practices designed to reduce carbon emissions across the community. Madison’s action comes on the heels of similar resolutions adopted by its neighbors, specifically the cities of Fitchburg and Monona, committing themselves to procure renewable energy sources to power their operations. In late February Fitchburg’s Common Council resolved to offset 100% of the city’s electricity demands from renewable energy resources by 2030. A week later, Monona adopted a resolution establishing an identical goal and deadline for its own electricity use, and coupled it with a renewable energy commitment by 2040 applicable to other energy uses, such as heating buildings and fueling vehicles. With these resolutions on the books, there are now five Wisconsin cities that have embraced a 100% renewable energy (or electricity) future for its operations, and have set deadlines for achieving it. The other two cities on that list are Eau Claire and Middleton (see comparison here). 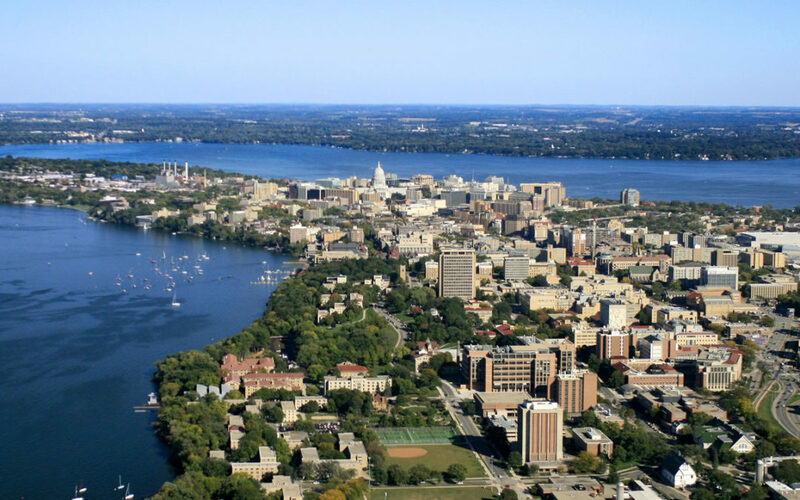 Adopted on March 19, 2019, Madison’s resolution emerged from a report commissioned by the city in March 2017 to analyze three different scenarios for achieving 100% renewable energy use and net zero carbon emissions. Of the three scenarios examined in the HGA/Navigant report, the SMC selected the 2030 pathway (Scenario 3), after a spirited discussion to identify certain implementation steps necessary to ensure that all City residents benefit from this transition. The resolution commits city staff to engage “committees and commissions to review and develop plans for policies, programs, and procedures to achieve the goals and targets in Scenario 3.” Between now and the end of the summer, SMC members will work with the relevant committees and commissions to shape and guide these implementation plans. These plans will be submitted in September. The HGA/Navigant report estimated $95 million in up-front investments over 12 years to achieve the City’s 2030 carbon reduction goals. Under Scenario 3, a combination of heightened building energy efficiency, additional supplies of renewable energy, and an increasingly electrified vehicle fleet produced the broadest array of benefits for city residents, including lower operating budgets and reductions in health-related expenses. According to HGA/Navigant, the social and economic benefits from this transition, coupled with the energy savings, would far surpass the original investment. At $60 million, the investment in electric buses shapes up to be the costliest element among the strategies analyzed, but one likeliest to yield substantial health benefits to the entire community. Already, the City of Madison has committed more than $2 million in project financing to leverage the construction of five solar arrays in western Wisconsin totaling 10 MWac. Construction has already begun on these arrays, and all will begin generating power this summer, enough to offset 37% of the City’s electric load on an annual basis. The arrays, owned by BluEarth and developed by OneEnergy Renewables, will serve the municipal utilities of Argyle, Cumberland, Elroy, Fennimore, and New Lisbon.